Pandora – The World of Avatar will transport guests to the visually stunning world of Pandora, where floating mountains and bioluminescent plants will amaze visitors of this magnificent land, beginning May 27, 2017 in Disney’s Animal Kingdom at the Walt Disney World Resort in Bay Lake, Florida, near Orlando. Guests can join the Na’vi on two excursions that take adventure to the next level, according to Disney Parks. First, the family friendly Na’vi River Journey will send guests through a bioluminescent rainforest. The river journey will end in an unforgettable encounter with a Na’vi Shaman — a figure who has a deep connection to the life force of Pandora. 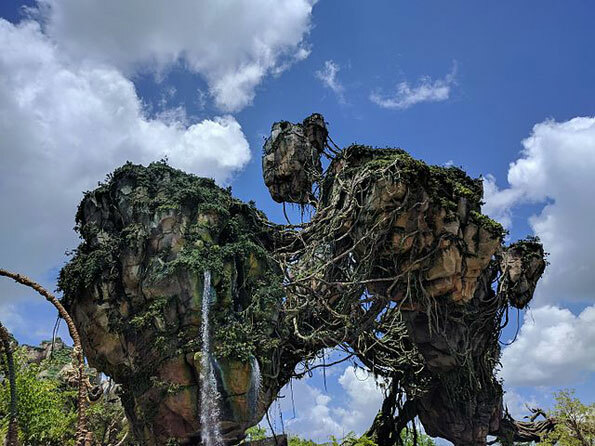 The second excursion, known as Avatar Flight of Passage, will present guests the jaw-dropping experience of exploring the world of Pandora atop a Banshee. Mountain banshees are large, bird-like aerial predators that are native to Pandora. Banshees are used by the Na’vi for hunting from the air and traveling larger distances. Banshees are also used in battle, where the rider/warrior mounted on the Banshee has the capability to attack its opponents from the air. Dining and shopping areas include Satu’li Canteen, Pongu Pongu (beverages) and Windtraders — a shop including Na’vi cultural items, toys, science kits, and more.